February 2017 – All things metaphysical. All tarot readers need a place that enables them to pause their daily lives when reading and reflecting on the tarot. As my tarot journey evolved, so has my sacred space for this purpose. I began in my bed, as this is one of the only places a mom of two girls can find peace and quiet. However, it soon became clear that this area would not suffice. It simply did not provide the kind of respite and sanctuary required for me to truly disconnect. Because there wasn’t a separate space, the lines between work and rest and study and play became blurred very quickly. I now have two spaces within my home that I use solely for readings and meditation. The first is an altar in my bedroom. This consists of little more than a small wooden table and a meditation pad. Facing east, this cozy nook provides the perfect place to pause, meditate, and do my daily reading each morning. This is also where I sometimes conduct remote or online readings for my clients. The other area where I conduct readings is outside at a private table on my covered porch. This area is particularly loved, as it comfortably seats two people. The fact that I live in the woods and am surrounded by nature adds to the aesthetics and charm of this sacred space. When I sit at the table alone or with a client, it reminds me that I have stepped into a different zone and a different frame of mind. In the past, I would shuffle the cards and fan them out on my bed or at the kitchen table. However, I have come to see that using the table outside lends itself to a better reading. I also find that it makes my clients more comfortable. Regardless of the area I use, I have an established routine I use to cleanse the area and prepare myself to work with the tarot. First, I use a variety of crystals. I use several different kinds to ground myself, including black tourmaline and smoky quartz. These settle me down and remove any negative energy. Once this has been done, I use a variety of other crystals to amplify psychic energy and strengthen my intentions to work with spirit, including quartz, blue kyanite, and amethyst. I then smudge the area with sage and light a candle. Frankincense oil is always used, as it promotes feelings of peace, relaxation, and satisfaction. I apply it to my pulse points and close my eyes, calming my mind. I then conduct a short meditation, and select the deck that I feel is best for the reading. I only begin a reading after I am thoroughly prepared. If you don’t have an extra room or space for a table, finding a place to work with the cards may seem difficult. You can make do in any space if you have a few key objects to help transform your daily space into a sacred space. First, an altar cloth or special piece of fabric is essential. This protects your cards from stickiness and/or spills that may be lurking on the surface of your table. I also suggest having a candle and a particular oil or incense that relaxes you and helps your mind shift from its regular pace to one that is more relaxed and open. Finally, a small statue or icon that you can fix your eyes on while you meditate is also helpful. My first statue was a small statue of the Buddha that I acquired from World Market. Working with the tarot is a huge commitment and it takes up a lot of time, and it’s important to have established boundaries within your home to help keep it from bleeding into personal time with your family and friends. Because I have separate spaces to work with the tarot, I can step out of my daily life and into my sacred space in a way that honors my personal life. When I’m in my sacred space, I do not answer my phone or think about what I am doing at work that day. When I leave my sacred space, the only thing I take with me is the peace from my meditation and the insight I received from the cards. 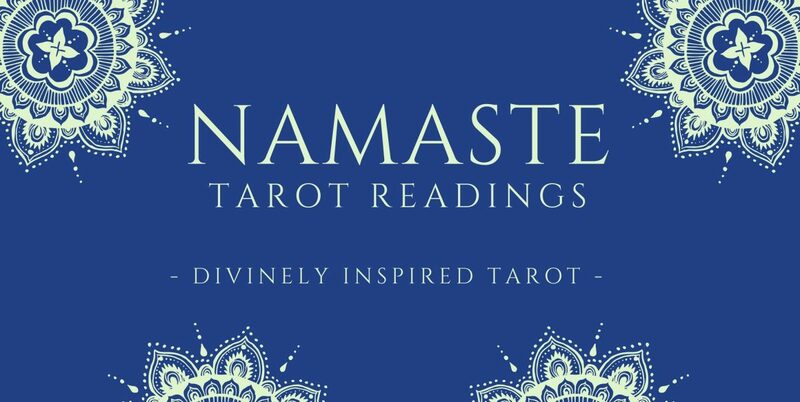 Do you have a sacred space for tarot? Tell me about it in the comments. My name is Bethany, and I began my journey with tarot many years ago. I received my first tarot card reading when I was seventeen years old and at a tremendous crossroads in my young adult life. Confused and frightened, I turned to my friend’s mother that had years of experience reading tarot cards. I watched, fascinated, as she unfolded a beautiful piece of crimson silk and took from it her trusted tarot deck. She laid the cards out in a cross and studied them with her piercing blue eyes. A moment passed and she began to speak. I sat, stunned, as everything she said aligned perfectly to my current situation. Tears came to my eyes as she spoke about the recent challenges I had experienced, but alas, the future was bright. My life was about to change in a very big way – and for the better, she said. She assured me that if I continued on my current path I would be glad I did. I left her house that days feeling relieved and at peace knowing that everything was going to be okay. A month later I was married to my high school sweetheart, and eight months later I gave birth to a beautiful, healthy little girl. In April my husband and I celebrated our 18th wedding anniversary. After that first reading, I was given my first Rider Waite tarot deck by a friend. I have been a student of the tarot ever since. Years later, as a professional reader, I now sit beside clients with the same frightened expression I wore many years ago. It is my turn to comfort them when they cry, or to congratulate them when life promises the fresh new start they are seeking. There is no greater honor than to assist people spiritually by providing divine guidance when they need it most. If you are in need of such guidance, please reach out.